FUNdraising Options for your School! SCOOPS2U can help you earn big profits for your school with our FUNdraising options! Have us at your next event and we can donate a percentage of the earnings back to the school PTA. We can sell from one of our trucks and our new popcorn tent. The Scoops2U mascot, Coneman can even make a special appearance! 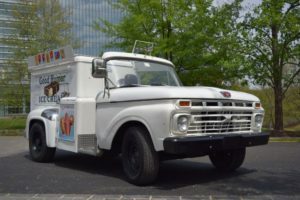 New to the SCOOPS2U fleet is the Good Humor Vintage Truck, which will make your school event unforgettable! The Good Humor truck is only available to sell novelties and will be reserved on a first come-first serve basis. Book us for your Next FUNdraising Event!